Help us build a world where every individual is free to follow his or her conscience, and where comprehensive reproductive healthcare is safe, legal and accessible for all. 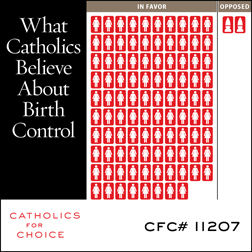 Donate to Catholics for Choice now. While abortion remains unavailable for millions of women, 40 million live with HIV/AIDS and ultraconservatives lobby against condoms and family planning, we work to ensure access to safe and affordable reproductive healthcare services at home and abroad. Where all women and men are trusted to make moral decisions about their lives. Where the decision to start a family is thoughtful and planned. Where policy makers and advocates are free to support policies that create a more just and compassionate society. Where life-saving health interventions aren't blocked by sectarian interests. Where abortion is safe, legal and truly accessible, and both contraception and child care are available and affordable.